Well you guys, I did it! 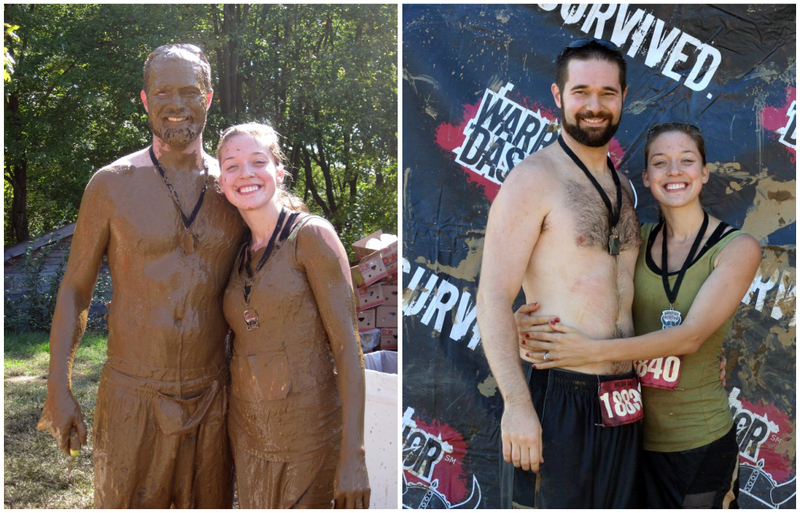 I made it through the Warrior Dash in mostly one piece, and I had a blast while doing it. Not only was the Warrior Dash my very first 5K, this bad boy had twelve obstacles to get through as well, including a (frigid) bog, a pit of mud, climbing over trucks, leaping over fire, and much more! I tried to back out the night before, but Matt wouldn't let me, he knows how I get when I am nervous. I'm glad he made me go through with it! I had a great time, and it felt really good to run again (no, I didn't run at all in advance, 'cause I am a planner and all). Here is our group before the race. UPDATE: Our local news had a little blurb about it, and they focused on our group for a few seconds in the beginning. You can mostly just see Sean (the cow) I was hiding behind Nelson (the bald dude). If you want, you can check it out here. Next year I am going to have to talk more girls into running with me! I was way outnumbered! Much to our surprise the race kicked off with some flames! This is us going through the mud pit, which was actually the second to last obstacle. (I am the farthest person to the right, Matt is probably too deep in the mud to see at this point.) Despite the many people on the sidelines encouraging Matt to dunk me in the mud, he was smart enough to know that was a BAD idea. Wise husband. After the mud pit came the final obstacle, the Warrior Roast. Since we were carrying what felt like ten pounds of mud by this time, it was actually kind of hard to summon the energy to jump over fire! This is the group that finished together, I'm sad to say the cow and company from the original group photo left us in their dust, despite many promises to stick together! As an unexpected bonus Matt got a nice mud mask out of the deal. His skin feels dewy and fresh, much like a baby's bottom...in a very dirty diaper. Here we are before and after being hosed off with a fire hose. We had such a fun time doing this together, Matt patiently waited for me despite my snails pace, and I sweetly boasted after beating him through the bog and over the cargo net. After the race we celebrated in true warrior style with some enormous turkey legs. The girl you see here is Ally, whom I met for the first time at the Warrior Dash, she is also the source of any of the photos of me. Thanks!! If this event comes to your area, I encourage you to do it. It is SO fun. And you know the best part? You get a kickin' warrior helmet out the deal! That is friggin awesome. I didn't know girls could do that too! Count me in for next year. Cute photos; looks like a great event. When I saw how slippery the ground was right by the fire, I could only picture myself slipping in the mud and landing ON the fire. Does that ever happen? Haha probably, I did see one guy get carted off in the Emergency car, maybe thats what happened! There were parts of the course that were so muddy we basically had to crawl up holding onto trees! It was slick! LOL Looks like a blast!! Congrats!!! I knew you would have a blast. This is freaking amazing! You are so cool for having done this! What a great experience! I am so happy for you - and this looks like such fun! You did terrific!!! hey smash! Already planning on it! It is in Jim Thorpe! Where Matt used to live, which should be fun in general! I'm impressed and you should get double points for being the only girl in your group. Way to go!